Machine learning is such a buzzword, or words, these days. Perhaps one of the biggest advocates of this technology, the almighty Google has been applying it to many of its services over the past few months. Now photographs on Google+ are getting some love with the addition of RAISR, which allows for low-resolution images to receive massive bumps in quality while saving on bandwidth. This initiative comes from the desire to help users who have data caps, spotty Internet connection, or both to view high-quality photos without sucking all their data or taking forever to load. RAISR, which stands for Rapid and Accurate Image Super-Resolution, utilizes machine learning to improve low-res pictures. 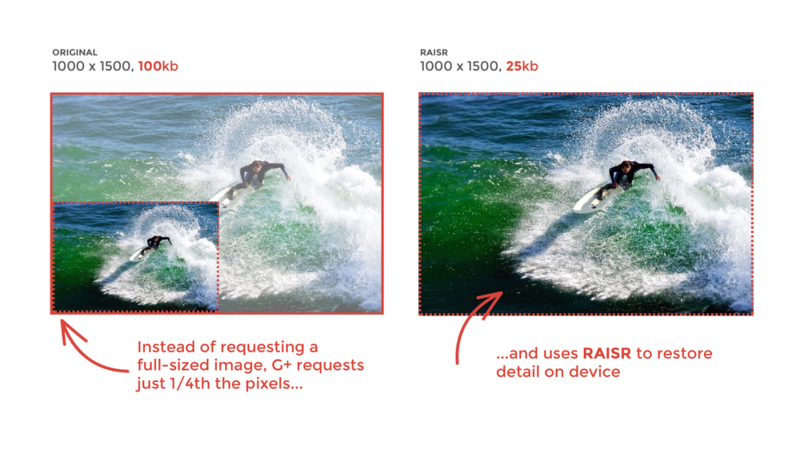 When used with the photographic content on Google+, RAISR can use up to 75% less bandwidth than the full-resolution version. This is being tested only on images that appear in the streams of a "subset of Android devices." Google claims that it is applying the technology to over one billion pictures a week, which has cut total user bandwidth by about 33%. The plan is to broaden the rollout over the coming weeks.